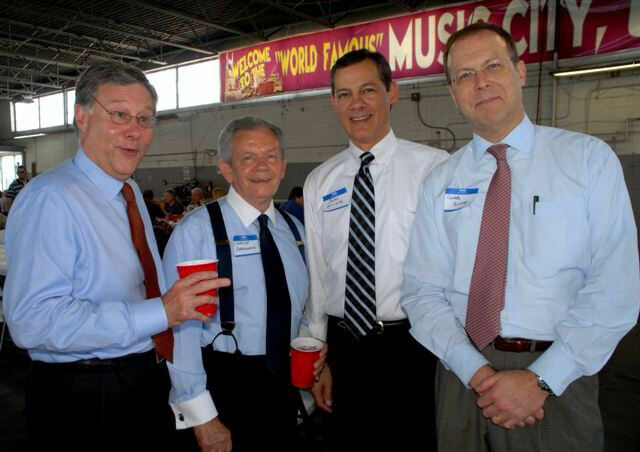 From left to right, Finance Director Rich Riebeling, head Metro tax collector Charlie Cardwell, Metro Clerk John Arriola, and the Mayor's dapper deputy Greg Hinote enjoy a back-slapping good ole (boy) time at a recent fish fry sponsored by influence-peddling business leader Bobby Joslin. For his patronage of Metro big shots, Joslin (who is also a power broker with the Nashville Business Coalition) enjoys an appointment to the Airport Authority. But you can bet Metro executives show up when Bobby adds them to his guest list, even when flood recovery is less than a month old.